Oral health issues are the most common health problems diagnosed in adult pets. 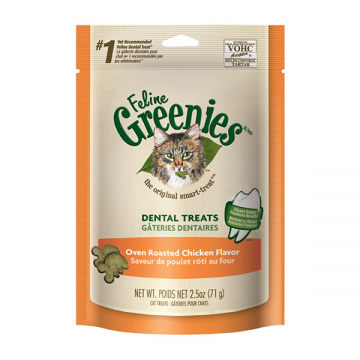 Feline Greenies Dental Treats offer complete nutrition and help your cat maintain good dental care. They have a unique shape and crunchy texture that's proven to reduce tartar. Plus, with an irresistible taste, they are sure to stir up purrs of joy. Cat dental care has never been easier – or more delicious. Feed as a snack or treat in conjunction with your cat’s regular diet. For the best dental benefit, feed Feline Greenies Dental Treats daily. As with any treat, always adjust the amount of main meal to compensate for calories delivered by treats. Calorie Content: 1.25 kcal/treat ME (calculated).